I recently co-hosted a dinner party built around a literary theme and, in reference to Hemingway's memoir, we called is "A Moveable Feast." Once we decided to work with this idea, the inspiration came pouring out. We started by listing books that we loved: books from our childhood, books that shaped our views of the world, books that helped us through difficult times, books that made us laugh out loud, books so beautifully written we forgot we were even reading. I was amazed at how quickly we filled an entire page, dozens of titles. We built the menu and decor around some of our favorite and, at the end of the evening, sent each guest home with a curated list of 10 of our favorite reads and an Amazon gift card. Creating the initial list was such a fun exercise, we decided to expand and share more of our favorites, the books that we've read over and over again and have become part of our story. 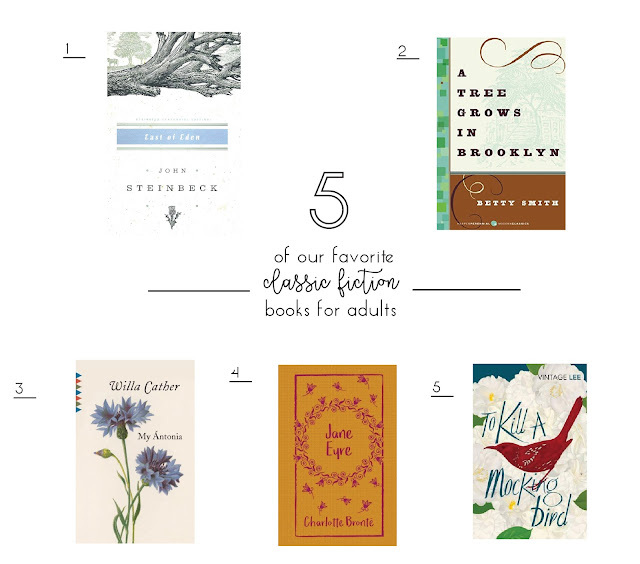 Here are five of our very favorite works of classic fiction. 2. A Tree Grows in Brooklyn by Betty Smith. One of the best coming-of-age novels ever written. Francie Nolan is irresistible. "Let me be something every minute of every hour of my life. Let me be gay; let me be sad. Let me be cold; let me be warm. Let me be hungry...have too much to eat. Let me be ragged or well dressed. Let me be sincere-be deceitful. Let me be truthful; let me be a liar. Let me be honorable and let me sin. Only let me be something every blessed minute. And when I sleep, let me dream all the time so that not one little piece of living is ever lost." 3. My Antonia by Willa Cather. This is just a beautiful story. Jim Burden, an orphan sent to live with his grandparents in rural and desolate Nebraska, he tells the story of his life through his one constant, deep love, the free spirited immigrant girl from Bohemia, Antonia. I don't think there's another novel that captures the American immigrant experience with such heart and life. 4. Jane Eyre by Charlotte Bronte. This book was one of my grandmother's favorites and it immediately became one of mine. Jane was a thoroughly original and, for her time, revolutionary heroine. I love her strength and her weakness. It's a novel with everything; grief, hope, love, betrayal and even a good dose of insanity. Also, if you have not learned about the lives of the Bronte sisters, you should. The entire family is absolutely fascinating. 5. To Kill a Mockingbird by Harper Lee. This book is so close to my heart that I haven't read Go Set a Watchman because I can't bear to think less of any of the characters that I love so much. This is a book that I've appreciated in different ways at different times in my life. When I was younger, it was a formative discussion of racial justice, respect, and humanity. As a parent, I have developed a profound appreciation for Atticus Finch and what, and how, he taught his children. Possibly my favorite book of all time.